Why advertise someone else's business when you can personalise your spare wheel cover or advertise your own business? 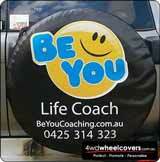 sparewheelcovers.com.au can professionally design and manufacture your custom spare wheel cover. 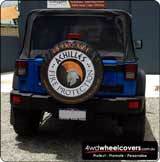 Choose from our great range of pre-designed spare tyre covers. Choose from fishing, 4x4, humour, animal, lifestyle and many other designs. 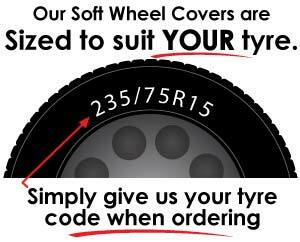 All covers are custom manufactured to your tyre size. This ensures a perfect fit for your 4x4 or caravan spare tyre. 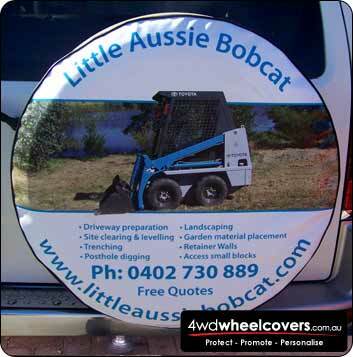 Our wheel covers are an inexpensive and high impact marketing and promotional tool for business. 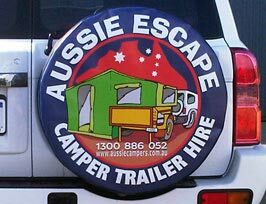 We specialise in large order runs for caravan, camper and 4x4 dealers, accessory shops and any business or club that needs inexpensive, durable advertising. Protect, promote and personalise your 4wd or caravan with a custom spare wheel cover. 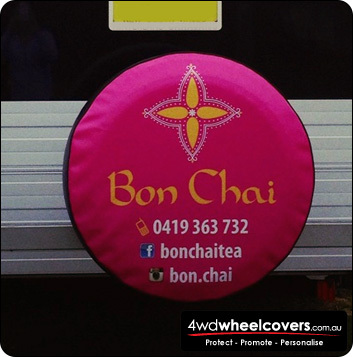 Tyre covers are a great way of promoting your business and products or to personalise your vehicle or caravan. We can incorporate any logo, picture, text or any other design you like in full colour, sure to catch the eye of viewers. 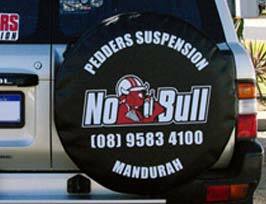 Our designer can layout and design a professional custom spare wheel cover for you, or you can send us the art in the correct format and we can manufacture direct from your designs. We also have many pre-designed tyre covers if you would like something from our range. Huge discounts on orders of more than one. Great for mass marketing or fleet vehicle advertising. Ask about our bulk order spare wheel covers. 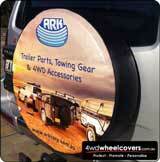 We offer Digital or Screen printed spare tyre covers. We will help you decide what is the most cost effective or best suited to your requirements. Our soft wheel covers are custom sized to suit YOUR tyre, which ensures a great looking cover with a perfect fit. Our hard case wheel covers come in various sizes to suit many wheel sizes. The cover fit beautifully and the design looks fabulous. Thank you for your fast service and great work. We have a huge range of pre-designed spare wheel covers. 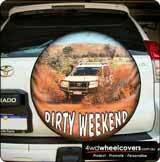 Check them out... Pre-Designed Spare Wheel Covers. If you prefer you can view our complete list of cover designs.